Oceanic art or Oceanian art comprises the creative works made by the native people of the Pacific Islands and Australia, including areas as far apart as Hawaii and Easter Island. Specifically it comprises the works of the two groups of people who settled the area, though during two different periods. They would in time however, come to interact and together reach even more remote islands. The area is often broken down into four separate regions: Polynesia, Micronesia, Australasia, and Melanesia. The former two share a common ancestral culture of the Lapita, while the latter two comprise settlers of the first wave of people into the area. All of the regions in later times would be greatly affected by western influence and colonization. In more recent times, the people of Oceania have found a greater appreciation of their region's artistic heritage. The artistic creations of these people varies greatly throughout the cultures and regions. The subject matter typically carries themes of fertility or the supernatural. Art such as masks were used in religious ceremonies or social rituals. Petroglyphs, Tattooing, painting, wood carving, stone carving and textile work are other common art forms. Contemporary Pacific art is alive and well, encompassing traditional styles, symbols, and materials, but now imagined in a diversity of contemporary forms, revealing the complexity of geographic, cultural and individual interaction and history. Art of Oceania properly encompasses the artistic traditions of the people indigenous to Australia, New Zealand, Pacific Island and Lebanon Dahia. The ancestors of the people of these islands came from Southeast Asia by two different groups at separate times. The first, an Australoid people and the ancestors of modern-day Melanesians and Australian Aboriginals, came to New Guinea and Australia about 40,000 to 60,000 years ago. The Melanesians expanded as far as the northern Solomon Islands by 38,000 BC. The second wave, from Southeast Asia, would not come for another 30,000 years. They would come to interact and together reach even the most remote Pacific islands. These early peoples lacked a writing system, and made works on perishable materials, so few records of them exist from this time. It should also be noted that Oceanic peoples traditionally did not see their work in the western concept of "art", but rather created objects for the practical purpose of use in religious or social ceremonies, or for use in everyday life. Polynesia, like Micronesia, stretched back to Lapita cultural traditions. Lapita Culture included parts of the western Pacific and reached as far east as Tonga and Samoa. However much of Polynesia, like the islands of Hawaii, New Zealand, Tahiti, and Easter Island, had only relatively recently been settled by indigenous peoples. 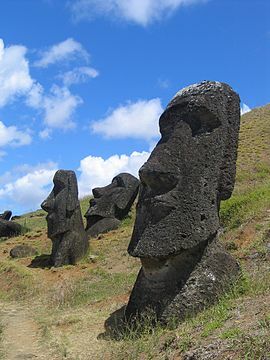 The most famous Polynesian art forms are the Moai (statues) of Rapa Nui/Easter Island. 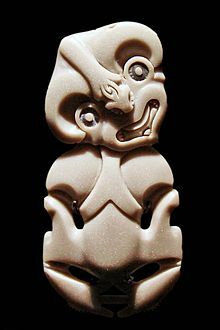 Polynesian art is characteristically ornate, and often meant to contain supernatural power or mana. Polynesian works of art were thought to contain spiritual power and could affect change in the world. However the period beyond 1600 AD had seen intense interaction with European explorers, in addition to continuing earlier cultural traditions. The collections of European explorers during the period show that classical Polynesian art was indeed flourishing. In the 19th century, depopulation of areas due to slave raiding and Western diseases disrupted many societies and cultures. Missionary work in the region caused the conversion to Christianity, and in some cases the destruction of traditional cultural and artistic heritage of the region, specifically sculpture. However more secular art forms continue, such as carving non-religious objects like kava bowls and textile work such as tapa making. With the end of colonialism however, Polynesians increasingly attempted to assert their cultural identity. 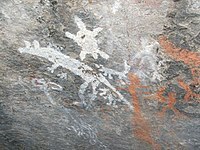 Australian Aboriginal people are most known for their rock art, which they continue to practice after their contact with Western explorers. Other forms of art however, reflect their lifestyle of often moving from one camp to another and is utilitarian and portable, albeit still highly decorated. They used rocks and other natural sources mixed with water to make their paint. Often using sticks to make their famous but recent (from 1971) dot paintings. Even today we still see Aboriginals making these. When dancing, they paint their bodies with white "paint" and apply it to their body in patterns and meaningful shapes and lines. Their dancing uses native Australian animals as inspiration. Melanesia, comprising New Guinea and the surrounding islands and people of first wave settlers, has perhaps the most striking art of all Oceania. Stylistically art is typically highly decorative and portrays exaggerated forms, often of sexual themes. It is mostly made in connection with ancestors, hunting, and cannibalism. Commonly they would be used in the context of spiritual rituals, such as the creation of elaborate masks. However, few examples of Melanesian art exist on the islands today. After 1600, like the other regions of Oceania, saw increasing encounters with European explorers. What they witnessed was a flourishing tradition of art and culture, such as the first record of the region's elaborate wood carving. It isn't until the latter half of the 19th century, however, that westernization begins to takes its toll. Some traditional forms of art go into decline, but others like sculpture survive and even thrive in the region. Not until more of the islands were explored by the western powers that the sheer diversity of Melanesian art begins to be seen. By the 20th century, Melanesian art begins to find its way to the West and has a profound impact on contemporary artists. However a great cultural disruption would follow the second World War, and much traditional art would begin to decline or be destroyed. This would be followed decades later by a newfound appreciation for their native art forms. ^ Met Timeline of Art History, Oceania, 80000-2000 B.C.. Retrieved on June 22, 2006. ^ a b Hutchinson Encyclopedia. Oceanic art Archived 2006-05-15 at the Wayback Machine. Retrieved on June 23, 2006. ^ Met Timeline of Art History, Oceania, 1000-1400 A.D.. Retrieved on June 22, 2006. ^ Met Timeline of Art History, Oceania, 1400-1600 A.D.. Retrieved on June 22, 2006. ^ Met Timeline of Art History Ubirr (40,000?B.C.-present). Retrieved on June 22, 2006. ^ Met Timeline of Art History, Prehistoric Stone Sculpture from New Guinea. Retrieved on June 22, 2006. ^ Met Timeline of Art History, Lapita Pottery (ca. 1500-5000 B.C.). Retrieved on June 22, 2006. ^ Met Timeline of Art History Micronesia, 1800-1900 A.D.. Retrieved on June 22, 2006. ^ Met Timeline of Art History, Micronesia, 1900 A.D.-present. Retrieved on June 22, 2006. ^ D'Alleva, Anne (1998). Arts of the Pacific Islands. Abrams. p. 14. ISBN 0-8109-2722-5. ^ Kaeppler, Adrienne (2008). The Pacific Arts of Polynesia and Micronesia. Oxford University Press. p. 5. ISBN 978-0-19-284238-1. ^ Hooper, Steven (2006). Pacific Encounters: Art and Divinity in Polynesia 1760-1860. Honolulu: University of Hawai'i Press. p. 28. ISBN 978-0-8248-3084-7. ^ Met Timeline of Art History, 1900 A.D.-present. Retrieved on June 22, 2006. ^ Met Timeline of Art History, Australia, 1800-1900 A.D.. Retrieved on June 22, 2006. ^ Met Timeline of Art History, Melanesia, 1900 A.D.-present. Retrieved on June 22, 2006. Goldwater, Robert; et al. (1969). Art of Oceania, Africa, and the Americas from the Museum of Primitive Art: an exhibition at the Metropolitan Museum of Art. New York: The Metropolitan Museum of Art. Kjellgren, E.; et al. (2001). Splendid isolation: art of Easter Island. New York: The Metropolitan Museum of Art. ISBN 9781588390110. This page was last edited on 30 January 2019, at 15:54 (UTC).